Sorry I haven’t been timely about this update but after coming back from Hong Kong, I’ve been swamped with getting things ready for my junior year of college, my new apartment, and band camp, but here I am with a free moment between the classes of my first day with time to actually organize my thoughts, pictures, and posts. This post will consist of a random smattering of the last couple of yarn stores I visited in Hong Kong and a couple random ones I found along the way. I was finally able to get inside Double Knit Yarn & Co located on Fa Yuen St. They had an amazing selection and I bought some neon yarn for only HK$25 per skein. The staff wasn’t very familiar with English, but let me browse and helped when they could. I got to go back to Yoko Labs as well. I wasn’t comfortable taking photos inside since there were a few customers but I bought a sparkly crochet hook which I used extensively on my 17 hour layover in Moscow. 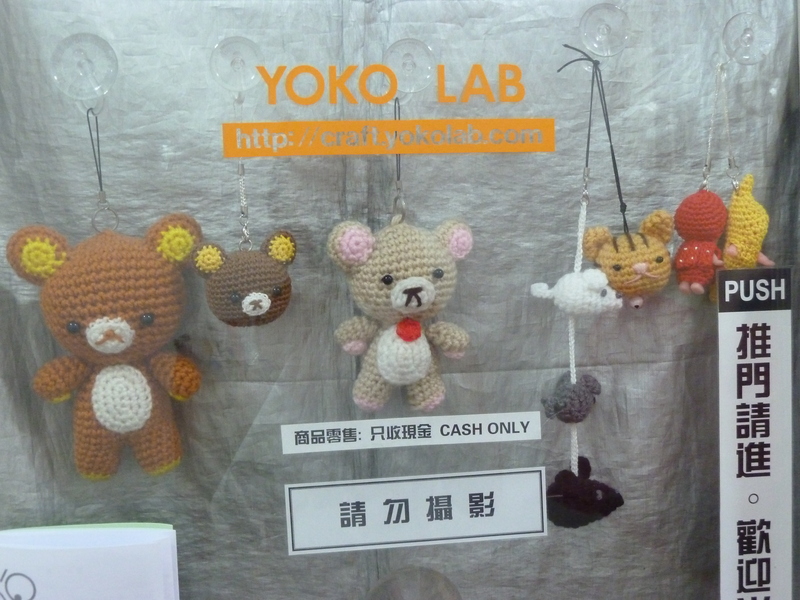 Yoko Labs is located in Granville Circuit in Tsim Sha Tsui and was on the small side but still a nice shop with more of a focus on crochet and amigurumi. 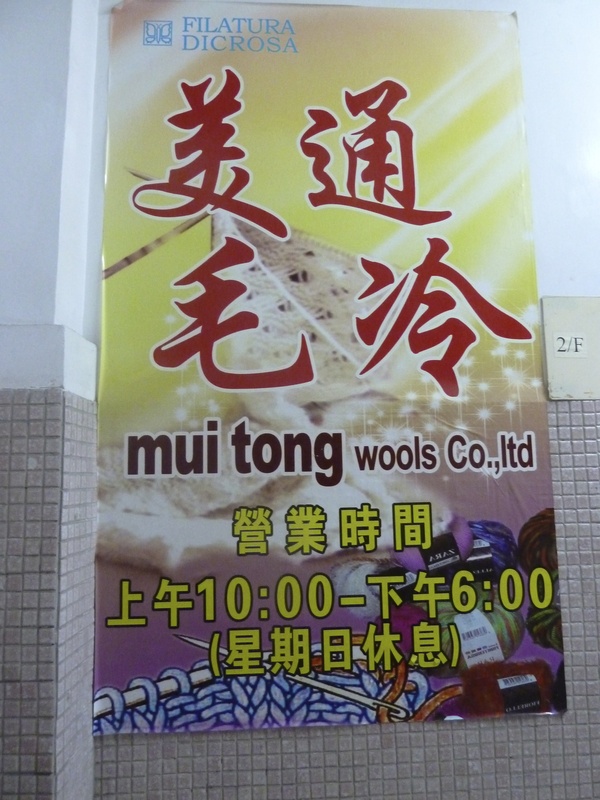 Mui Tong Wools is located in Sheung Wan. The shop is small but jam-packed with yarns. I found an adorable Japanese teddy bear sweater pattern book with really cute illustrations and was so close to buying it, but I decided that it wasn’t worth it. As you may have noticed, I got a bit discouraged from taking pictures inside because I didn’t want people to yell at me in Cantonese. Tailor and Alteration in Causeway Bay took me a while to find their new location. The first time I searched it I didn’t know they moved, but I got the chance to be in Causeway Bay again to do some HR paperwork for my internship so I took the opportunity to find it. I’m glad I did because the selection was great. I didn’t buy anything because I was already packed and bought too much yarn. This was the last yarn store I visited in Hong Kong. They were a little messy since they seemed to be in the process of moving in but the staff was helpful when needed. I’ve already mentioned a yarn store I stumbled across in the Dragon Centre in Sham Shui Po, but it turns out that there are actually a couple of them in the Apple Mall, and right next to each other. And there’s a store that sells belts in the Argyle Centre that also sells yarn! I believe it is on the 3rd floor. The Argyle Centre was my favorite place to buy clothes and it was right by my workplace so I went a few times. One day last week, I was having a horribly unproductive day at work so I decided to leave early and Knitting World, located somewhere between Mongkok and Yau Ma Tei Stations. Yarn always seems to help out on these kinds of sluggish days. This shop is a little tough to find, but if you end up in a market place, you’re nearly there. Look past the fruit stands and situated on the third floor of Prosper Commercial Building is Knitting World. They don’t have as big or high quality of a selection as Filo Kilo, but definitely one of the better yarn shops I’ve visited so far. The employees at Knitting World were not very skilled in English but still welcoming. I wasn’t planning on buying anything but once I was in there and saw some of their options, I couldn’t resist. I bought one skein of cotton in the color of the sunset which I’m hoping I can salvage enough for socks which costed around HK$50. At this point I had attempted to visit three yarn stores, had success with two, never managed to catch the other one when it was open, and bought cheap wool and needles from a market stand. I was beginning to believe that I would not be able to visit all 15 the yarn stores on my Hong Kong yarn shop list. With only three weeks left, some of them just seemed too far away and not worth the subway fares if I was’t going to stop on the way for something else. However, this past Saturday I had what may be the most amazing day I’ve spent in Hong Kong, and I wasn’t even on Hong Kong Island. I took a solo trip up to New Territories, Hong Kong which is located in the northwest and is connected to mainland China to walk the Ping Shan Heritage Trail. You can read all about it, and in great detail, on my study abroad blog. Because I was already going so far up north, why not make a pit stop to three yarn stores on my list? Wool Workshop was the absolute cutest, most warm, and welcoming of all the yarn stores I’ve been to in Hong Kong. It is located in Fortune Commercial Building. The atmosphere is very cozy and colorful. When I walked in a small group of ladies were crocheting. With my other experiences in Hong Kong yarn shops, I wanted to keep to myself since I wasn’t sure that they spoke English and I didn’t want them hovering down my back, but one of the employees was very good at English and so extremely nice! She asked me where I was from and how I found the store since it is located in a very local area of Hong Kong and I explained that there was a list floating around online. She gave me a chair and let me browse their small selection of yarns and pattern books. They didn’t have many novelty yarns, mostly just plain colored wools, so I didn’t feel compelled to buy anything because I could get something similar back home or online. I soon observed that this shop is very crochet-oriented, specializing in Japanese wool and crochet books. I told the employees that I don’t really crochet and she said that I could learn how to read Japanese patterns right there at the shop. I was really fond of the offer but I told the ladies that I lived a 45 minute MTR ride away. How unfortunate! I totally would have gone back. After a little more looking and some photos I thanked them and was on my way to stop #2. After a bit of wandering and luck I found myself in the Tsuen Fung Centre where PC Knitting Co is located. The shop is tiny, the staff doesn’t know much English, and they honestly didn’t seem very happy to see me. The also didn’t let me take pictures inside the store but I did mange to get one of the front. It was really hard to browse because the shop was so small. I couldn’t move with three other women in there knitting and chatting. It was kind of a let down after Wool Workshop. I had so much trouble trying to find Mei Fun Wools Co which was supposed to be a 5 minute walk away and when I thought I found it, I didn’t find any yarn! Now that I go back and look at the address I realized that it’s located on the second floor of the Wah Kin House, not the first. I will never get used to all these skyscrapers! I can see the tiny staircase on Google Maps now. Darn, I should have been suspicious of the fact that I walked into a clothing boutique that didn’t sell anything knitted while believing that it was a store with wool in the name. In the Dragon Centre I went to this section called Apple Mall, which also has DIY things, of the Japanese variety. I bought myself a cross stitch kit for a Hello Kitty keychain and some candy making kits and keychains for my sister. When I was walking around I magically found Elegance Workshop, a Hong Kong yarn shop that was not mentioned by any source that I used to compile my list. This definitely made up for not finding Mei Fung Wools Co. Elegance Workshop was pretty small but had decent variety. I wasn’t able to look around long because the shopkeeper’s incredibly shy son came back and wanted to go into the store but with me blocking the way I decided just to leave and come back later, but then I forgot (whoops!) I’m guessing they have Japanese yarns since most of the items in that mall boasted Japanese origin. Today was a failure in terms of doing what I had planned. Lesson learned: if you want to do something, do it yourself. I wasn’t planning on spending all day shopping on Granville Road, but I was able to find Yoko Labs, another yarn store. However, it was closed today since it was a public holiday. I’ll make another stop after work one day to check it out when it’s open. So far I’ve been good about not buying yarn in every place I look. I guess I just lucked out in finding great selections in the beginning. There have been some hits and misses but I guess it’s not possible to find every yarn shop in Hong Kong. I have three weeks left and I’m hoping to see at least three more shops. Be sure to visit me on helloiminhongkong as well! Hello from the other side of the world! If you’ve been paying attention to my posts or been following along on my study abroad blog, you’ll know that I’m currently in Hong Kong interning with GE Healthcare. Of course I had to check out what this Asian city has to offer yarn-wise. What else would a knit-addict do? I compiled a list from this post, which has been conveniently made into this map which I found on this Hong Kong Ravelry group. I’ve been meaning to take a weekend and just hit up all the stores in one day, but that would take the entire day traveling up to Tsuen Wan and then down to Causeway Bay so I have ended up just making stops here and there on my way to and from other places like work. I work in Mongkok, and there’s three yarn stores around the area: Double Knit Yarn & Co. and Filo Kilo to the north, by Prince Edward station and Knitting World to the south one stop down by Yau Ma Tei. One day after work a few weeks ago I tried to find Double Knit Yarn & Co. without success. It’s located on Fa Yuen St. which is also where the Fa Yuen Markets are. I ended up getting immersed into the market and couldn’t find the store front. I did, however, found two street vendors selling identical yarn for super cheap. I was in yarn withdrawal so I had to buy some. 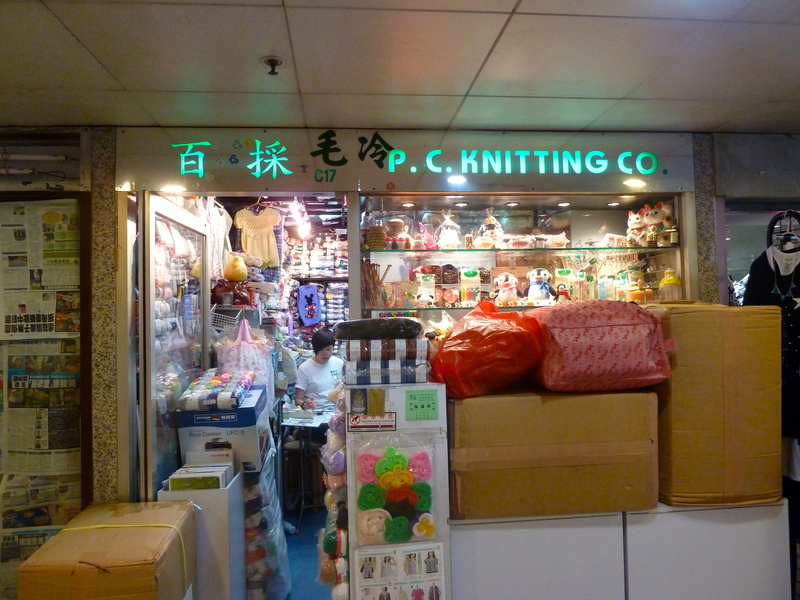 I got two bags of yarn and a pair of circular needles for HK$70, which is about US$9 – super cheap. I can’t read the Chinese on the labels but I think it’s a wool blend. I went back with another girl from my trip to go to the markets once again last Sunday and finally found it. However, it’s closed on Sundays. Located on up some sketchy stairs, is Double Knit Yarn & Co. What’s inside? I wouldn’t know. I went back after work today but they didn’t seem open even though the hours on their sign said they would be. Now, when I double check their website, it seems they close at 7:30 not 8 like the sign says so maybe I should go a bit earlier next time. Before going back to Double Knit, I found Filo Kilo on Sai Yee St. I was not expecting such a great selection! I wasn’t really planning on buying anything until I checked out all the yarn stores in Hong Kong but the saleswoman kept following me and I felt awkward coming in to take pictures without buying anything so I ended up buying a two balls of some really soft Japanese wool for HK$176 ~ US$22. It was 10% off, how could I resist?! I think I’m starting to become a yarn snob haha. I’m getting spoiled by specialty yarn shops and won’t be going back to Michael’s anymore. This is what I bought so far. I swear I’ll be coming back to the States with a suitcase full of yarn haha! I’ve started a simple brioche infinity scarf with the cheap wool blend in yellow because I need something to do in my hotel room while I watch the Chinese news. Hopefully I can see some of the other yarn shops in Hong Kong before I leave. If anything, Knitting World after work one day and the places in Causeway Bay on the weekend because a trip to that shopping hub is much needed anyways. I’ll be sure to update y GirlMeetsYarn followers with anymore yarn store visits and please check out http://www.helloiminhongkong.wordpress.com!